Day Job - Professional Genealogist for more than 30 years. 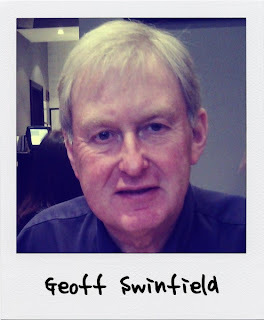 Founder of Geoff Swinfield Genealogical Services in 1999. In 1972, I decided to trace the history of my very unusual surname. Indeed, at that time, I knew only three other people with my name, being my father and mother and my widowed grandmother. Whilst at University in Nottingham, I set out to visit Leicester Record Office, the area where I was told my great-grandfather had come from. There I bumped into another Swinfield who took me home to meet his wife and four children! He proved to be my 4th cousin who had recorded a very large tree on a roll of wallpaper. I was hooked! After becoming a professional genealogist in 1979, I lead projects for several medical teams who wanted to construct larger genealogies for their patients who had been diagnosed with hereditary diseases. These included ovarian cancer, young-onset Alzheimer's, Von-Hippel Lindau's disease and later, glaucoma for Moorfields Eye Hospital. By extending the family trees, it was hoped that the defective gene(s) could be identified and mapped. Those at risk could be identified by genealogical screening and treated if possible. Later I collaborated with Dr Turi King of Leicester University (now famous for her work on extracting DNA from the bones of Richard III and proving him to be the long-lost king) with her project on Y-chromosomes and rarer surnames. This led me to an interesting discovery about the Swinfields which I have worked on for the next two decades. We also identified and researched a Yorkshire family which has one of the oldest forms of the Y-chromosome. I will illustrate how I have used DNA testing to learn more about my paternal ancestry and the story of my English surname of Swinfield. By integrating Y-chromosome testing with a one-name study, I have unearthed what is to me, and I hope to you, a fascinating story about my direct ancestral line and others who share my rare surname. The techniques used are applicable to all who want to use genetic testing to look critically at their genealogical tree or who are seeking evidence of how others with the same surname may be related.